It was a really busy weekend for me, so I am still getting caught up. 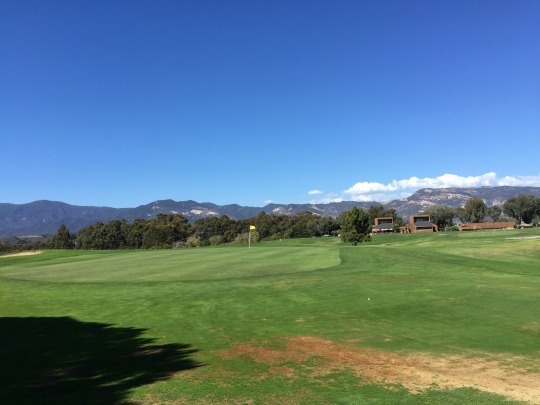 On Sunday, I headed up the coast to the Santa Barbara area to meet up with the Greenskeeper.org crew for another fun “GK Plays” outing at the famed Sandpiper Golf Club. 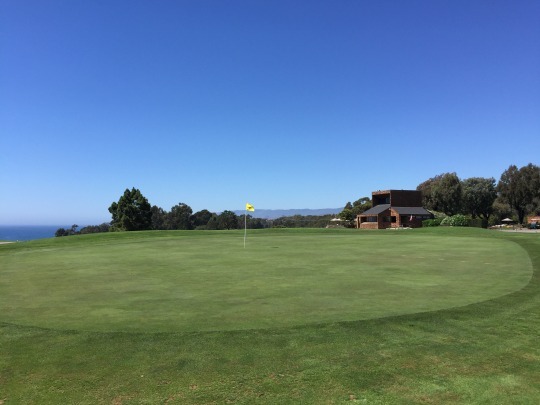 I played the course once before, but it has been many years since that visit. To be honest, I have kind of a romanticized memory of this course from that experience. 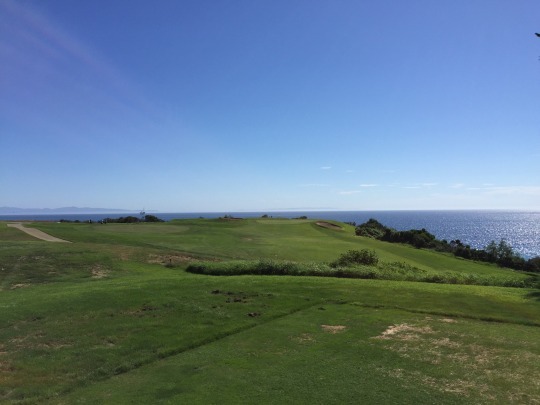 It was one of the first big “splurge” bucket list kind of courses for me, long before I shelled out huge bucks to play Pebble Beach or start taking these crazy and expensive cross-country trips. 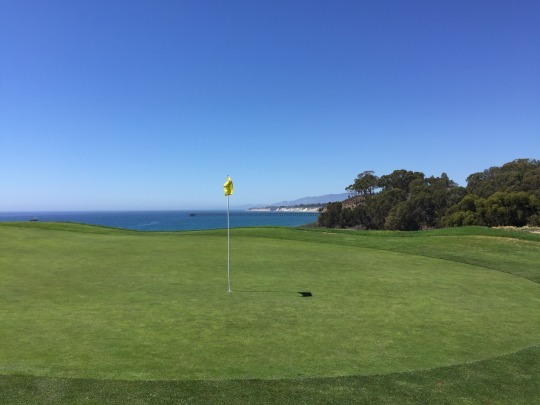 It was a well-known course right on the oceanfront and it was special for me to play there the first time. 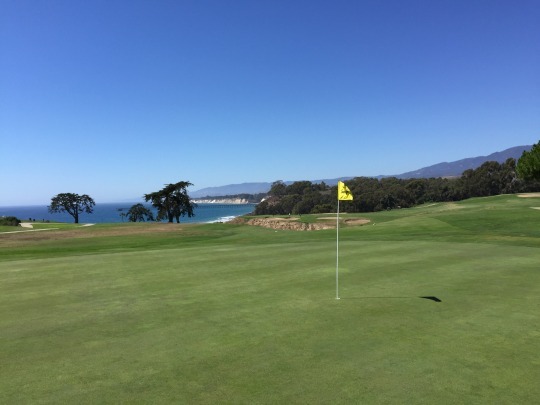 I remember being blown away by the coastal scenery, especially on holes 10-14, and the layout being pretty enjoyable. I remember the conditions being very good, but maybe not pristine. However, at that time I was probably less critical of conditions. Now, it is always a factor for me. That is most true when it comes to expensive “high-end” courses like Sandpiper promotes (and prices) itself. 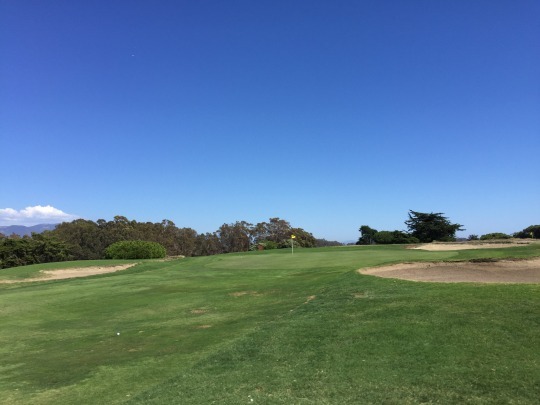 I was excited to sign up for this outing and revisit Sandpiper again. 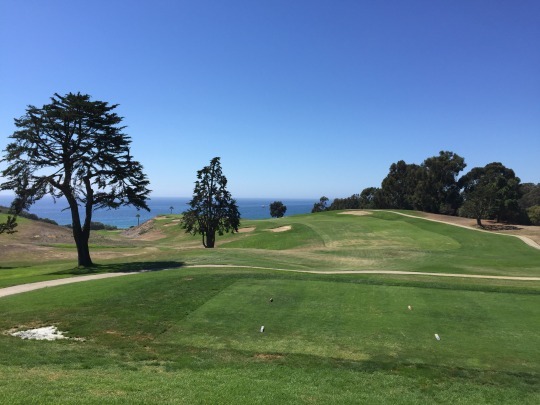 I knew the conditions would not be as nice as I remembered because this course is dealing with the drought just like all SoCal courses. It’s hit extra hard in this area, with the also once-great Rancho San Marcos being the worst victim of them all. 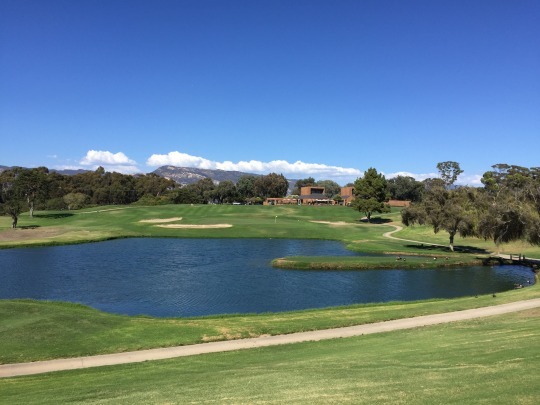 Still, it seems like many courses have done just fine with drought restrictions and I would expect Sandpiper to handle things pretty well since their price point is still rather high. More on the conditions later, though. I was in the first group off at 11:00 and we enjoyed a nice relaxed pace. We never really saw the groups in front of us and nobody else in the GK crowd pushed us from behind. 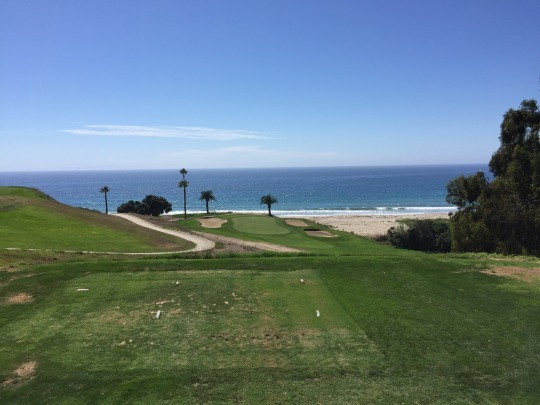 We had plenty of time to stop and take lots of pictures on the signature oceanfront holes, and it was a picture-perfect day there. 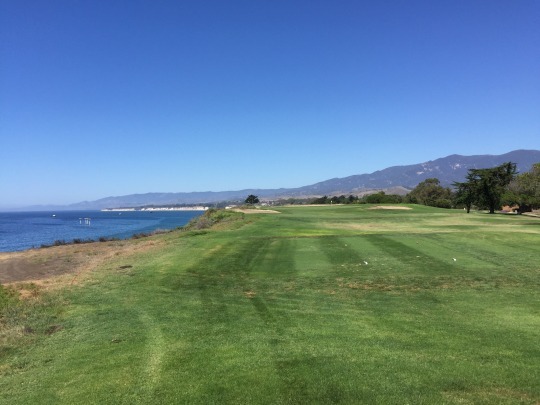 It was really windy in the afternoon, which made the course even more challenging, but the ocean breeze felt great on a relatively hot day for Santa Barbara. 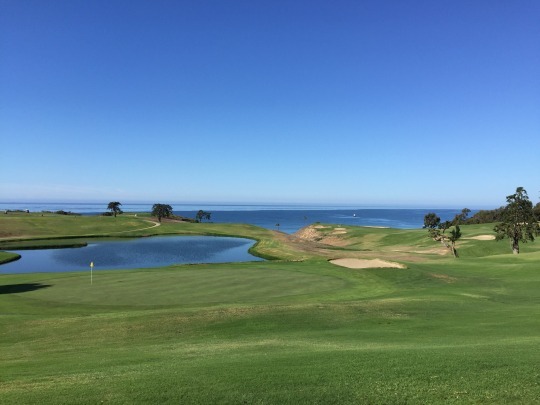 I will say Sandpiper has one of the best properties for a golf course anywhere in California. It is a simply beautiful setting overlooking the ocean. Most of the course is away from the water’s edge and it is a solid layout. It’s nothing too amazing or distinctive, but hole designs are diverse and challenging enough. 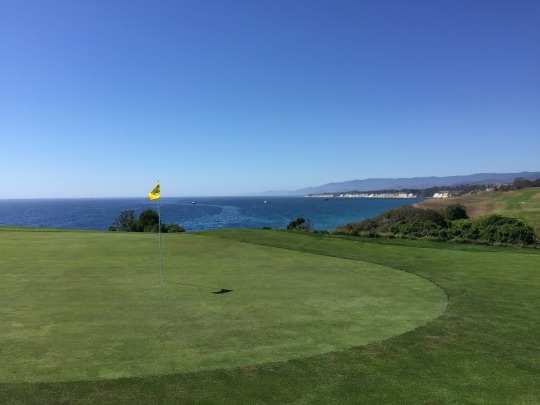 Then, where the course really shines is when you are right along the ocean. 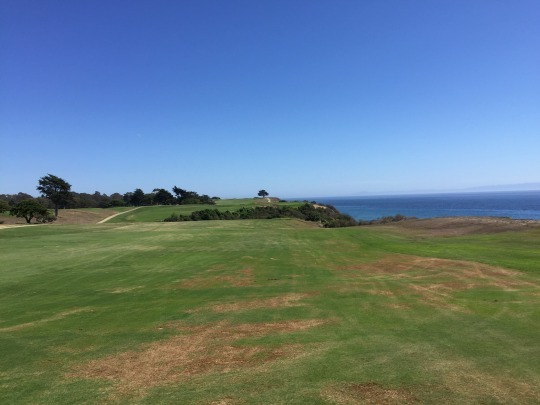 You get your first taste on the front nine when you reach the par-3 6th hole, but then you head back inland from there. After the turn is when things get really exciting. 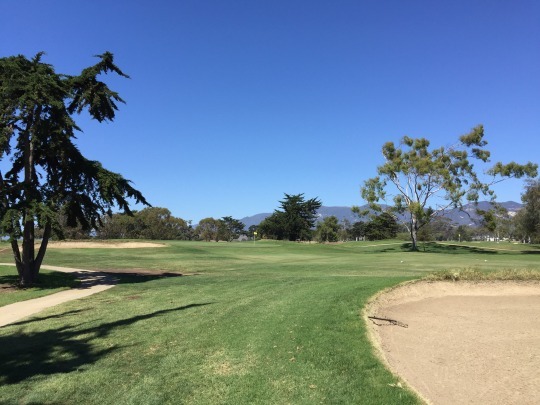 The 10th hole is one of my favorites. 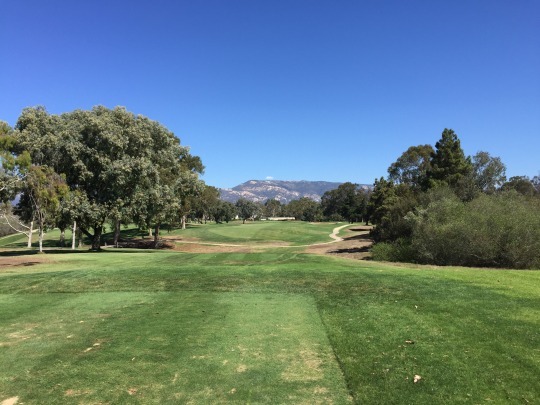 It’s a fun dogleg left design that plays downhill and offers different strategies depending on how much of the corner you want to try and bite off. The approach view with the ocean in the background is magnificent. 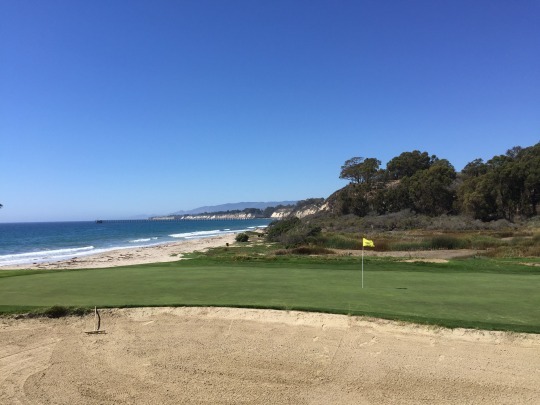 The 11th is certainly the most signature hole at Sandpiper and rightfully so. 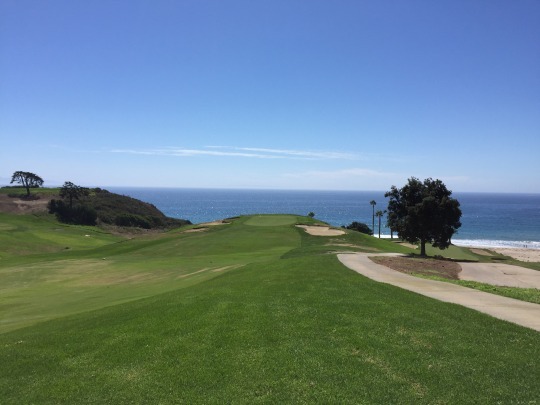 It is a stunning par-3 playing downhill and right to the edge of the beach below. 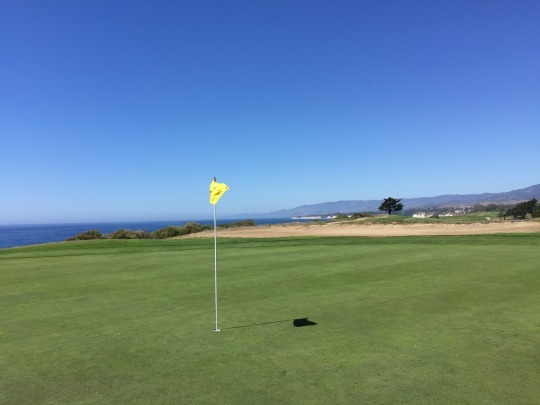 This was the first time my playing partners had been to the course, so it was neat to see their eyes light up when gazing upon this hole for the first time. I remember how I felt before and it was nice to see this cool hole in person once again. The 12th is an unusual par-4 that is a big dogleg right and severely uphill all the way to provide semi-blind tee and approach shots. 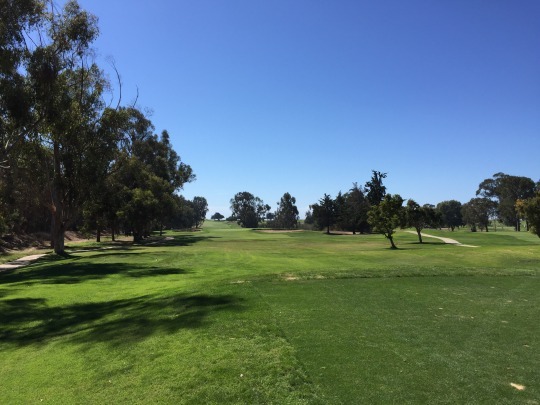 The 13th is a demanding par-5 with all sorts of risk/reward options for long hitters. The 14th is a pretty straightforward hole and more forgiving than the others in this stretch, but as it runs along the top of the cliff it’s still a beauty. After that, you head back inland with some decent holes. 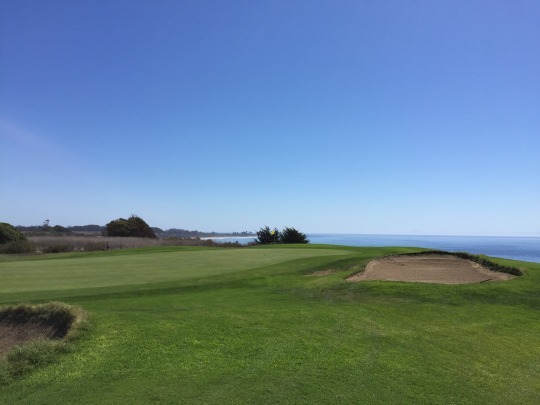 The 18th is unusual in that it’s a par-3 and also has the only water hazard on the course (if you don’t count the Pacific Ocean on those other holes). Condition-wise, the highlight was the greens. Though not lightning fast, they did roll well and downhill putts were definitely tough to stop. Uphill putts really had to be struck firmly to hold the line and get to the hole. You definitely want to be below the hole here as much as possible. Unfortunately, the rest of the conditions left a lot to be desired. The tee boxes were fine. No problems there. 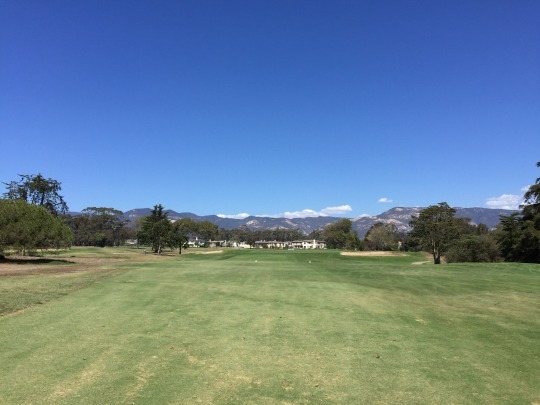 The fairways did have a lot of bare spots and have a dried-out look to them, even though I still felt like I found a ton of mushy wet spots, too. The fairways did seem a bit better on the back nine than the front, but overall they were still rather disappointing for a course of this caliber. The rough was hit or miss, but generally penal. Either it was a lush/deep grassy area, hardpan or somewhat patchy, so you never knew what you might get. I was in a couple bunkers. The first (#6) was very wet and muddy. The other (#18) was better, but still nothing too impressive. I know the drought has been hitting Sandpiper hard, but the rates are still so high here and it kind of feels like a shell of its former self. 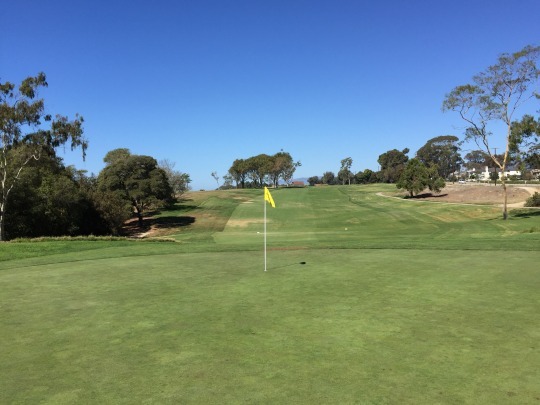 The drought is affecting all SoCal courses, but I have played many recently and a lot have still been in very good shape. 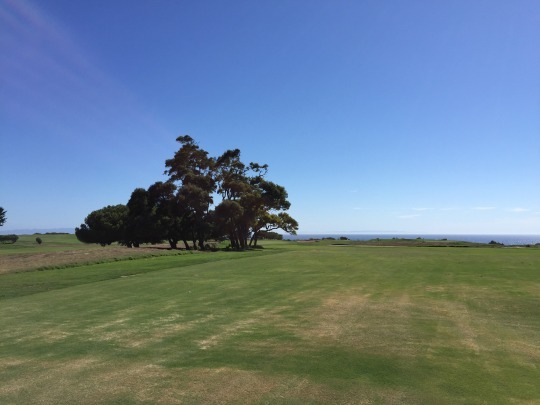 When the fairways are better at Cresta Verde (where I played for $10 recently) compared to Sandpiper (well over $100 in peak hours), that’s not a good sign and it makes paying the money to play here harder to justify. We got a pretty decent deal for a weekend round with the GK Plays ($95), so that was nice, but I’d have a very hard time paying rack here anytime in the near future. 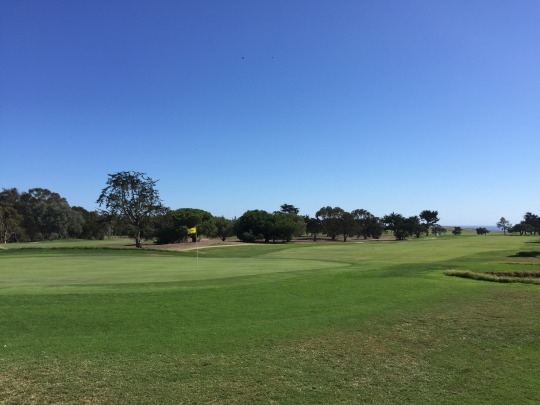 Of course, Cresta Verde doesn’t have the architecture or ocean views of Sandpiper and they are pretty amazing, so that will always enable them to demand a higher price here. The overall relaxed vibe here is nice, too, so you are also paying for a little less crowds. 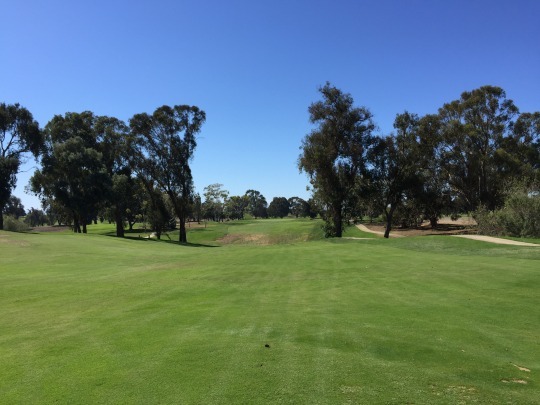 I’d love to see the course recover from the drought issues (come on, El Niño!) and return to its former glory someday, because it is such a special setting and a pretty enjoyable layout.